Corporate whistleblowers and congressional critics contend such arrangements—which are common in orthopedic surgery—amount to kickbacks to stoke sales of medical devices. They argue that the overuse of surgical hardware ranging from heart stents to artificial hips is a big factor behind the soaring costs of Medicare, the government medical-insurance system for the elderly and disabled. Medtronic says it can't develop new medical products that improve patients' lives without the help of surgeons. It says the royalties it pays them are legitimate but it doesn't give detailed information about what intellectual property each recipient contributes. It says it doesn't pay its collaborating surgeons royalties on the devices they personally use in their patients, removing any financial incentive for them to do more surgeries than necessary. Norton's Dr. Glassman cited this policy as a safeguard against any conflict of interest and said the royalties he and his colleagues receive are "legitimate." He added that they inform their patients of their financial ties with Medtronic. Norton Hospital said it has policies "to prevent direct conflicts of interest." The other Norton surgeons didn't respond to requests for comment put to them through Norton and Dr. Glassman. 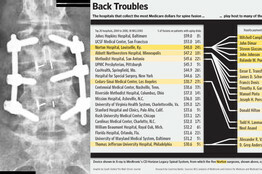 Using a Medicare database that tracks hospitals' billing, The Wall Street Journal was able to ascertain that Norton is among the most aggressive practitioners of spinal fusion in the country. Spinal fusion has become one of medicine's most controversial procedures. It involves fusing together two or more vertebrae to alleviate back pain, usually with the help of metal plates, rods and screws implanted in the patient's back. Tens of thousands of dollars of hardware can go into a single surgery. Medtronic is the biggest maker of spinal implants. Last year, its spine business generated world-wide sales of $3.5 billion, accounting for half of the roughly $7 billion spinal-implant market. Conservative spine surgeons argue that a spinal fusion is appropriate only for a small number of conditions, such as spinal instability, spinal fracture or a severe curvature of the spine known as scoliosis, and that financial incentives have caused the procedure to become overused. Others say it's a useful tool to treat patients who have debilitating back pain and have tried other options like physical therapy to no avail. The Journal consulted several experts to determine which back conditions are commonly thought to require a fusion and which are subject to the most debate. The most hotly debated use of spinal fusion surgery centers on patients who merely suffer from aging disks, a condition known as degenerative disk disease. One health insurer, the nonprofit Blue Cross and Blue Shield of North Carolina, announced in September that it would stop paying for spine fusions performed on such patients beginning on Jan. 1. The insurer said that the procedures are "considered not medically necessary." The Journal mined hospitals' Medicare claims to see what proportion of fusions performed fall in this category. Due to a three-decade-old court ruling guarding the confidentiality of physician information, the paper is barred from disclosing what it found regarding the five Norton surgeons. Critics of the court ruling and of the privacy policies of the federal Medicare program argue that making such information public would help taxpayers understand where their money is going, and potentially deter abusive or wasteful practices. But the Journal is permitted to disclose its findings for Norton Hospital as a whole, where 27 surgeons performed one or more spine fusions in 2008. In emailed responses to questions, Dr. Glassman said he and his four colleagues "do not overuse spine fusion procedures," and argued that the diagnostic codes the Journal based its analysis on "do not convey indication for spinal fusion with the specificity that you are attributing to this data." Citing studies he has published in medical journals, Dr. Glassman added that he and his colleagues were "leaders among spine surgeons nationally in comparative effectiveness research" and in developing ways to measure the outcomes of spinal fusions. Spinal fusion as it's currently practiced is a relatively recent addition to American medicine. 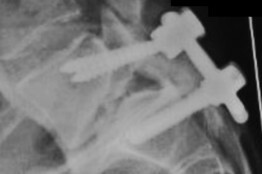 The use of spinal implants to help the fusion of vertebrae was pioneered by surgeons in France in the 1980s. The U.S. Food and Drug Administration approved their use in 1995, ushering in a fast-growing medical industry in the U.S.
Medtronic became the market leader in 1998 when it acquired Memphis-based Sofamor Danek Inc., itself the product of an earlier merger between a French and an American company. According to the Journal's analysis of Medicare claims, the procedure went from costing Medicare $343 million in 1997 to $2.24 billion in 2008. Adjusted for inflation, that's nearly a 400% increase. A large portion of that money flowed back to device makers, whose expensive implants eat up most of Medicare's reimbursement for the procedure. Spinal implants became big profit generators for device makers. The screws used to drill into bone, known as pedicle screws, sell for $1,000 to $2,000 apiece but cost less than $100 to make. A bone-growth protein used to help vertebrae fuse can sell for more than $5,000 a pack, depending on the size. "You can easily put $30,000 worth of hardware in a person during a fusion surgery," says Charles Rosen, a spine surgeon at the University of California, Irvine School of Medicine who created a group called the Association for Medical Ethics to combat what it sees as conflicts of interest in spine surgery. Some recent studies have suggested poor outcomes for spinal fusion. A study published in the Journal of the American Medical Association, or JAMA, in April found that Medicare patients with a condition called spinal stenosis who had more than two vertebrae fused, a procedure known as a complex fusion, were nearly three times more likely to have life-threatening complications than patients who had a less invasive procedure known as a decompression. Spinal stenosis is a narrowing of the spine which puts pressure on the spinal cord or spinal nerves. Another study of workers' compensation cases published this year in the online edition of the journal Spine showed that patients who had a spinal fusion were much less likely to return to work within two years after their surgery than a group of patients with similar conditions who didn't have surgery, and that 27% of them had to be re-operated on. Their rate of permanent disability was more than five times as high as the patients whose spines weren't fused, and their daily intake of powerful narcotic painkillers increased by 41% after surgery. The study's lead authors, Trang Nguyen and David Randolph of the University of Cincinnati College of Medicine, said magnetic resonance imaging scans of the spines of eight of the 725 patients who had a fusion "were perfectly normal," suggesting their surgeries were unnecessary. Other studies have focused on the benefits of fusions. At the annual meeting of the American Academy of Orthopaedic Surgeons in Las Vegas in February 2009, Norton's Dr. Glassman presented a study on lumbar fusions that showed a significant improvement in fused patients' back pain, leg pain and other quality-of-life measures, both one and two years after their surgery. The study suggested the improvement was even greater in patients older than 65. For surgeons, the financial incentives to perform spine fusions can be strong. Though hospitals often lose money on the procedure when it's performed on Medicare patients due to the high cost of the implants, the surgeons themselves can get paid as much as $12,000 per surgery. Complex fusions, the procedure studied in the JAMA paper, are reimbursed by Medicare at a sharply higher rate than decompressions, to account for the elaborate spinal devices used and the longer length of surgery. Complex fusions increased 15-fold among Medicare beneficiaries with spinal stenosis from 2002 to 2007, according to the JAMA study. A big part of many surgeons' income lies in their consulting and royalty arrangements with device makers, although disclosure of these arrangements remains piecemeal for now. Medtronic began releasing information about its payments to surgeons on its website in June, after coming under intense scrutiny from Sen. Charles Grassley (R., Iowa). Five other makers of orthopedic devices have disclosed their payments to surgeons who perform hip and knee replacements following a probe by U.S. prosecutors that resulted in a $311 million settlement in 2007. A new federal law included in the federal health-care overhaul mandates disclosures of all such physician payments by 2013. At the North American Spine Society's annual conference in Orlando, Fla., in October, more than 250 spine surgeons self-disclosed financial relationships with spine-device manufacturers under a policy adopted by the professional group. Many reported receiving hundreds of thousands of dollars or more from multiple device makers, in addition to having private investments in numerous companies. One surgeon at a hospital in the Midwest disclosed receiving between $400,000 and $1.3 million in royalty, consulting and other payments from three spine-device makers. Using the Medicare-claims database, the Journal found this surgeon performed 276 spinal fusions on Medicare patients in 2008, by far the most of any surgeon in the country. According to the Journal's analysis, 38% of those fusions were performed on patients with aging disks. More than half of this surgeon's patients were residents of two counties with fusion rates four times the national average. Due to privacy constraints, the Journal is barred from naming this surgeon. Alexander Vaccaro, a spine surgeon at Thomas Jefferson University Hospital in Philadelphia, disclosed receiving between $415,000 and $2.03 million in royalties from six device makers in 2009, and between $165,000 and $666,000 in consulting fees from nine device makers. Dr. Vaccaro also disclosed owning stock in 28 companies, mostly medical-device makers. Medtronic's website shows that the company paid Dr. Vaccaro $1.28 million in royalties in the first three quarters of 2010. Cultivating good relations with surgeons like Dr. Vaccaro is valuable to device makers because they often perform more than 100 spine fusions a year and use thousands of dollars of implantable devices during each surgery. They can also influence the clinical practices of their peers by speaking at medical conferences or authoring research papers in medical journals. Based on the Journal's analysis, Dr. Vaccaro's hospital performed 1,177 spine fusions on Medicare beneficiaries from 2004 to 2008. It received a total of $30.6 million from Medicare for those surgeries, ranking it 20th among all U.S. hospitals by the amount of Medicare dollars collected for the procedure. Thomas Jefferson ranked No. 4 among hospitals that perform the highest proportion of complex fusions. Asked about his extensive financial relationships with device makers, Dr. Vaccaro said: "It looks crazy, I agree." But he said he has no say in which spine products his hospital uses. Dr. Vaccaro said he doesn't receive royalties from Medtronic on devices he personally implants. He added that he tells his patients about his relationships with device makers in the consent form he makes them sign before operating on them. Not all spine surgeons with industry ties do so. When Timothy Roberson, a 48-year-old former tire-factory worker, had his spine fused by surgeon Kevin Foley at Memphis's Methodist University Hospital in August 2000, he says Dr. Foley didn't tell him of his relationship with Medtronic. Mr. Roberson says the disks above his fused vertebrae wore out within 18 months of the operation because of the extra stress they had to bear—a risk of fusion surgery. To deal with the pain, he had a pump implanted in his stomach that he refills with narcotics every five weeks. Mr. Roberson sued Dr. Foley for malpractice, but the litigation was initially over an unrelated issue. He alleged in his suit that he lost the use of his biceps after being left prone on the operating table with his arms elevated for nearly seven hours before the surgery started. The case was tried three times, and by the third Mr. Roberson added allegations that the surgery had damaged his back. The first two trials ended in hung juries; Dr. Foley won the third in 2008. Dr. Foley has had royalty-bearing agreements with Medtronic since 1996. The company paid him more than $27 million from 2001 to 2006, according to internal Medtronic documents reviewed by the Journal. On its website, the company discloses paying him another $13 million in royalties in the first three quarters of this year alone. Dr. Foley's attorney, Buckner Wellford, said there was no reason for Dr. Foley to disclose his Medtronic relationship to Mr. Roberson because the pedicle screws he used in the surgery, though made by Medtronic, weren't invented by Dr. Foley and earned him no royalties. Mr. Wellford adds that the fusion surgery Dr. Foley performed on Mr. Roberson was successful and didn't cause his current back condition. Asked whether he ever tells his patients of his ties to Medtronic, Dr. Foley responded in an email that he doesn't receive any royalties from Medtronic on devices he has contributed to when they are implanted in patients by himself, members of his practice or hospitals where he has admitting privileges. Brian Henry, a spokesman for Medtronic, says the company applies that policy to all its collaborating surgeons, thereby eliminating the temptation for them to do more surgeries to earn more royalty income. Two former Medtronic employees have alleged in separate whistleblower lawsuits that the royalty agreements are intended to disguise the fact that the payments the company makes to surgeons are really kickbacks for using Medtronic devices. One of the suits was filed in U.S. District Court in Memphis, Tenn., in 2002 by a former counsel at Medtronic's spine division. After the Justice Department joined the suit, Medtronic settled the case for $40 million in 2006 while denying wrongdoing. The other suit was subsequently dismissed. Most of the settled suit remains sealed, but the Journal reviewed an unredacted copy. It says the five surgeons at Kentucky's Norton Hospital became Medtronic's biggest spine client after they signed consulting and royalty deals with the company in early 2001. Medtronic declined to comment on the suit. In an email, Dr. Glassman said he had no knowledge of it but added that the Medtronic royalties were "for legitimate contributions to the development of" a Medtronic device used to treat scoliosis and other conditions. Medtronic doesn't specify how it awards royalties and consulting fees to surgeons involved in the invention of new devices. It says surgeons' device-development work goes beyond mere consulting when the company deems that they are contributing valuable intellectual property to a product. But that intellectual property doesn't necessarily have to be patented, it says. A search of spine-device patents awarded to the Norton surgeons turned up about a dozen total for Drs. Puno, Johnson, Campbell and Dimar, most owned by companies other than Medtronic. The search turned up no patents for Dr. Glassman. Norton and Medtronic both declined to say how much of that money went to pay for Medtronic devices. But, through a hospital spokesman, Dr. Glassman and his colleagues acknowledged "predominantly" using Medtronic devices in their surgeries. —Courtney Banks contributed to this article.